Huey and Dalian read a book. 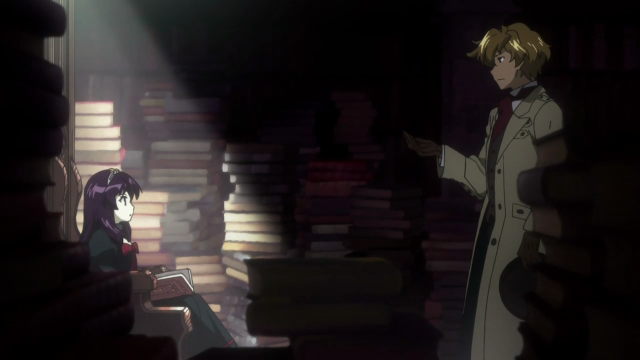 With the airing of Dantalian no Shoka (Bibliotheca mystica de Dantalian, AKA Mystical Library of Dantalian), the Summer 2011 season is officially in full swing, that is all series have now aired. 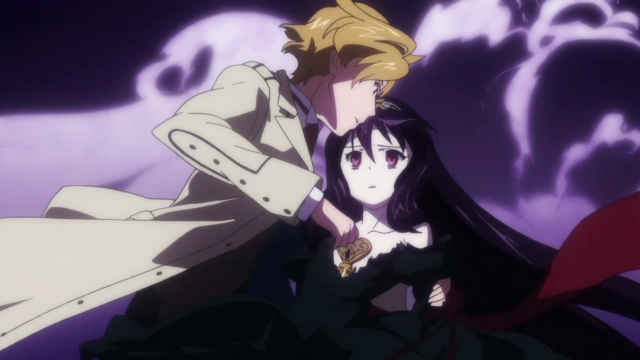 Dantalian, a show many have compared to Gosick, might not be the best offering this Summer, but it has at least one thing going for it. Here I talk about what was great, as well as what I didn’t think was very good. This is, without any doubt, the greatest ED of the season, probably the decade. The song is certainly unique, but the visuals are imaginative, creepy, and utterly compelling. There is a sort of pseudo-story, of someone using a strange box, first to watch an odd show, as if it were a Kinetoscope. Then she cuts a lock of her hair and inserts that into the box. Some gears are seen cranking, then the box opens up, and a person with a mule head gives her a box within which is a book within which is a box within which … is her own hair? Finally, a creepy goth-fairy blows bubbles. The whole thing is rather disturbing, but it is THE MOST ORIGINAL anime ED I have ever seen. This ED alone compels me to watch a few more episodes of Dantalian non Shoka. On the plus side: I liked watching Huey and his car. On the negative side: I wasn't impressed by much of the artwork. 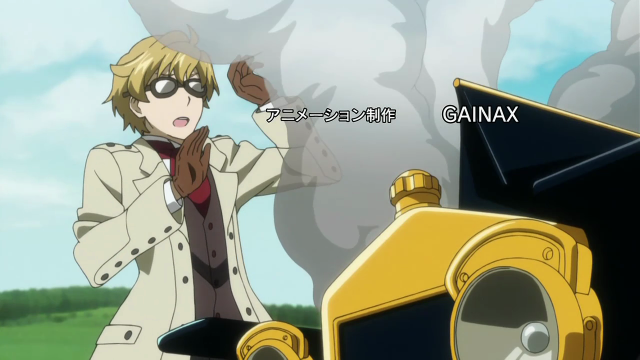 One reason Dantalian is being compared to Gosick is that both take place in Europe in the 1920s. 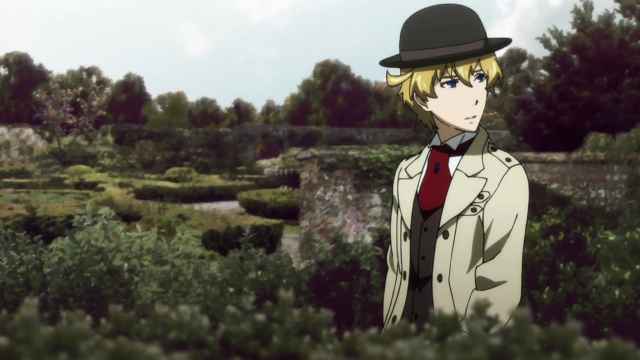 Dantalian‘s male lead, Huey was a pilot in WWI, and this is a distinguishing characteristic, in contrast to Gosick‘s Kujo, who was a schoolboy. The scene in which Huey drives through the British countryside was charming, but wasn’t very long. A later scene of him making tea in the kitchen of his inherited mansion, was good, but mostly I really didn’t feel the atmosphere. You can see in the screen shot of Huey in the garden that some shots were composed of photographs and drawings. I complained in my Double-J review about the laziness of simply pasting drawn characters onto a photograph without making any attempt to mesh the two by applying a filter or something to the background. Here I should point out that, although I still am not impressed with this technique, the animation quality is far superior (though the art doesn’t work for me). What I mean is that, while in Double-J, character drawings were merely superimposed on top of a still photograph (lazy, lazy, lazy), here Gainax (the production company) actually animates the scenery, by compositing the photograph in layers; the closer the scenery layers are to the viewer’s perspective (the “camera”), the quicker those elements move. I will definitely give Gainax credit for using good animation techniques to elevate this (in my mind questionable) art technique, but the effect still seems jarring to me, because the background has too much detail (continuous tone) in comparison to the cel-shaded style of the character. Finally that hat *does not* look right to me; it seems to be a bit too large, and floating above, instead of sitting upon, Huey’s head. No. Huey finds a doll-like girl sitting amongst a pile of books at THE BOTTOM of the stairs. If you look at the various screen captures that include Dalian (the female lead in Dantalian no Shoko), you will notice that her skin color is kind of a greenish-white. Victorica, the female lead of Gosick, was notably pale-skinned (porcelain), but she had an unmistakably human complexion. Despite this, certain characters rejected her humanity, which is one of the things that made Victorica a great character. On the contrary, Dalian rejects humanity. She is visibly alien. Instead of the caged wolf that Kujo sought to free, Dalian is Chii from Chobits, a second-hand magical girlfriend, and Huey’s property. Huey sticks his key in Dalian's lock. I also want to clarify one more thing. This (at least this first episode) was NOT a mystery. 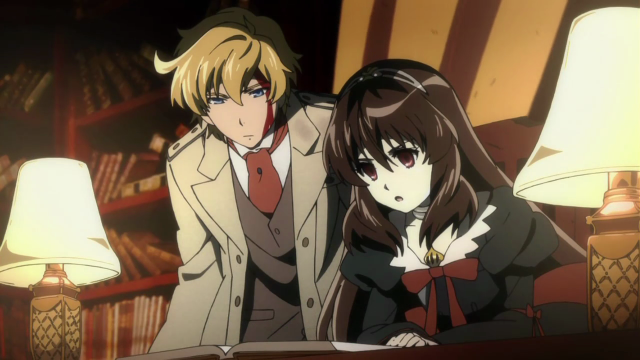 There are people saying that Dantalian is like Gosick, because Dalian is a super-detective and the couple go around solving crimes. Now I don’t know what future episodes hold, but in this one, Dalian was a witness to the crime. She saw the man being murdered and the book taken. There was no mystery. 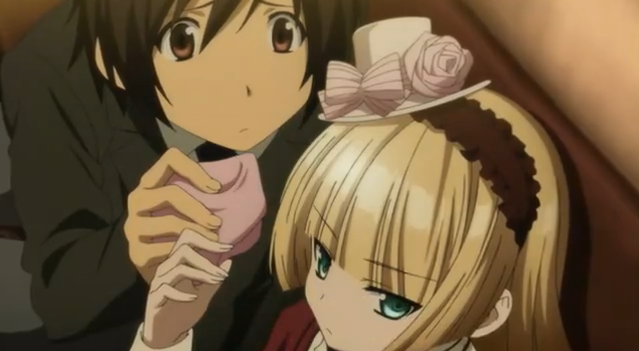 I feel compelled to point this out because some have gone so far as to call this show “Gosick improved”. No, it’s not. As I said, the ED was very compelling, so I will be giving Dantalian no Shoka a few more episodes at least, but I saw a run of the mill, fantasy-action / magical girlfriend show. Despite some superficialities, this show probably won’t ever match Gosick‘s compelling artwork, characters, or storyline. I agree about Dantalian being NOT a mystery series; it’s more of a supernatural adventure show… then just some horror, comedy, and mystery (there have was a time when a book was connected to a case, so some detective work was done). About the lolis being mistaken as dolls… I think Victoria’s height was a major factor on why she was mistaken for a doll, haha. That ED is undeniably creepy, compelling it may be but it sends shivers up my spine each time I watch it, there’s also something hauntingly creepy about the song as well. Putting that aside this episode was a pretty solid start, with Huey we’ve got a so-far-decent main character who’s background can explain the feats he pulled off. And it may just be my fanboyism towards Miyuki Sawashiro, but Dalian isn’t that bad either. However I think the comparisons to Gosick just come down to the initial Dalian-Victorique similarities and the setting itself, and if anything they’re what are only be seen at first glance and will become redundant as the series goes on. The Dalian-Index similarities are probably more prominent. It is creepy, but with a series about demons leaking into our world through books it seems appropriate. And, as I said, it is one of the most imaginative EDs I have ever seen. 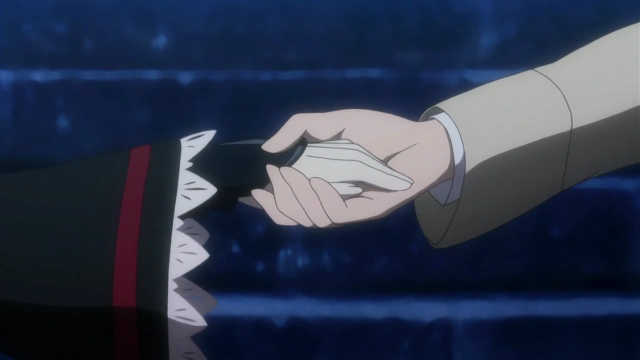 I agree that the comparisons to Gosick are going to seem quite weak after a few episodes. ED was creepy! Yes but agreed at least it is original and really fits the overall theme of books and magic. When I first heard about Dantalian I didn’t really see Gosick anywhere in this, well I also got bored of that series <.< Anyway I saw more of Toaru Majutsu no Index. both main lead girls have volumes of magical books sealed inside them making Dalian more like Index than Victorique to me of course. Not to mention that line of "I am hungry" good stuff thou! I like fantasy stuff, and books, so I’ll be watching (not to mention that brilliant ED). I never watched Index. I watched a few episodes of Railgun, but it didn’t impress me.